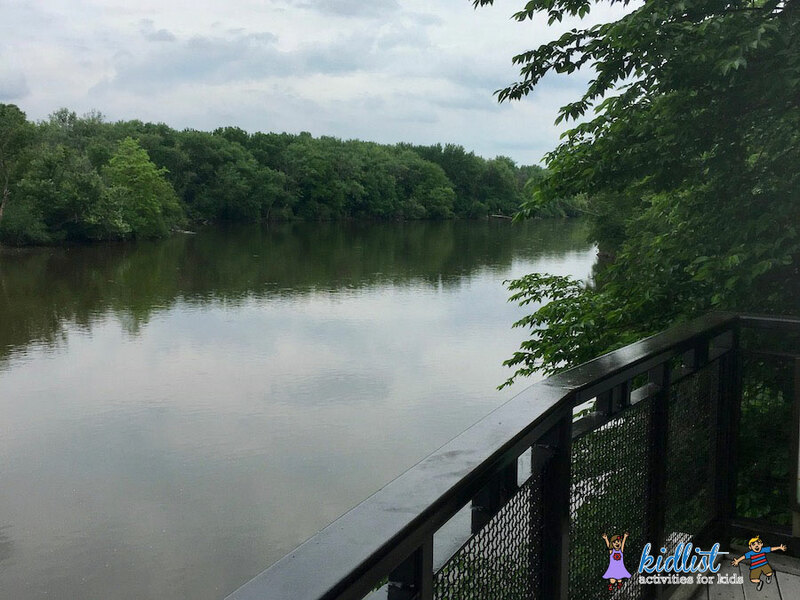 Red Oak Nature Center in Batavia was a great new find for our family, and one we will definitely venture back to again this summer. There are plenty of exhibits that bring your children up close and personal with native animals. We were all ears while walking through the trails as we heard woodpeckers and various ground animals searching for food. Pair your visit with lunch at a local restaurant or a stop at the nearby outlet mall, and you’ve got a full day! 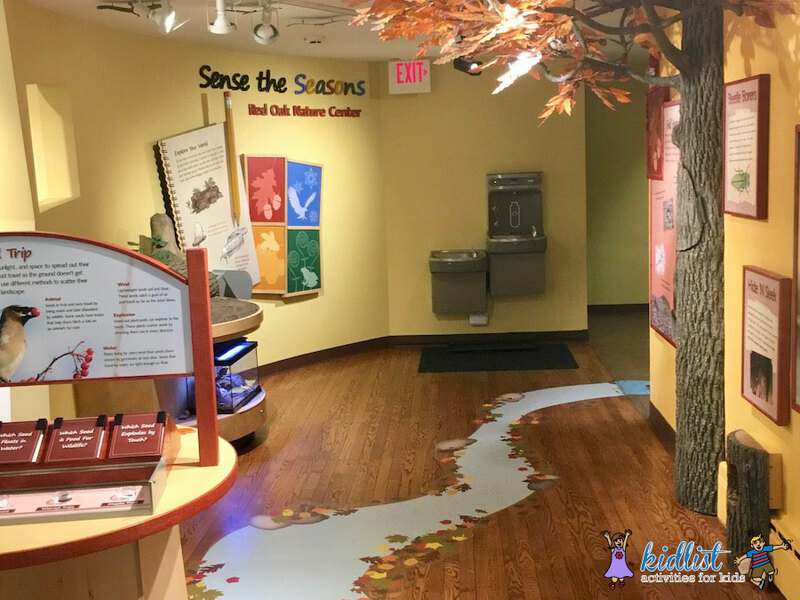 Inside the Red Oak Nature Center, you’ll find two main exhibits for your children: Sense the Seasons and Wildlife Room. Sense the Seasons gives kids a view into the changes in nature that take place across seasons. It also includes a bird-watching picture window, and displays for children to experience nature through a variety of senses. Smells of local flowers, or the soft touch of a skunk’s fur gave us a closer sense of the nature nearby. My girls loved pretending to be birds in the life-sized birds’ nest, or buzzing around in the bee hive. 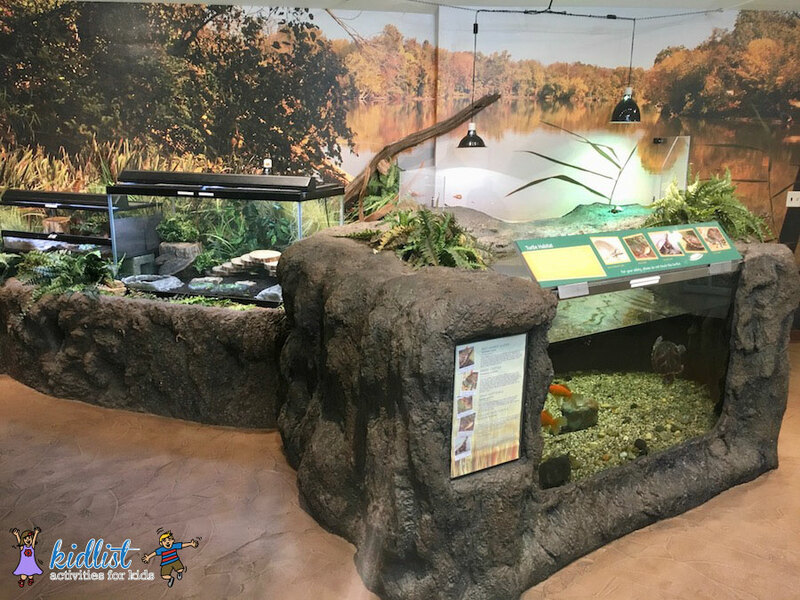 The Wildlife Room contains habitats for frogs, fish, turtles, salamanders, snakes and more. These exhibits were the perfect size and height for children, and easily observed with very active animals inside. All of these animals are native to the Fox River, which can be viewed on the Observation Deck outside. The nature center and observation deck are the starting point for a few different 1/4 or 1/3 mile mulch-lined trails. These are a great way to burn off some extra energy in the afternoon, but you may want to consider packing bug repellent along with your sunscreen. Right outside the nature center is a large picnic area for anyone to sit and enjoy a meal, and there are a few benches along the paths for rest stops. Down the road, and in a separate parking area, families can find Lippold Park. If you’re interested in extending your visit, this space includes a boardwalk across a pond, and a large nature-based playground. 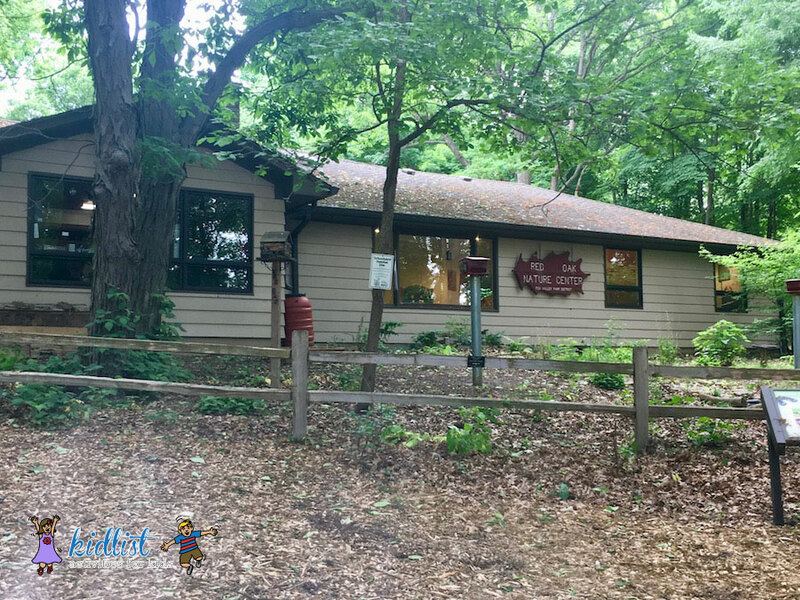 Food and drinks are not sold at Red Oak Nature Center, and there are no restaurants within walking distance, so make sure to pack a lunch or stop along the way. There is a picnic area with ample space outside the nature center. Drinking fountains can be found inside near the restrooms. Restrooms with changing tables can be found inside of the nature center, but these are only accessible during regular business hours. This information is current as of June 2018. Make sure to check their website for holiday hours or schedule changes. 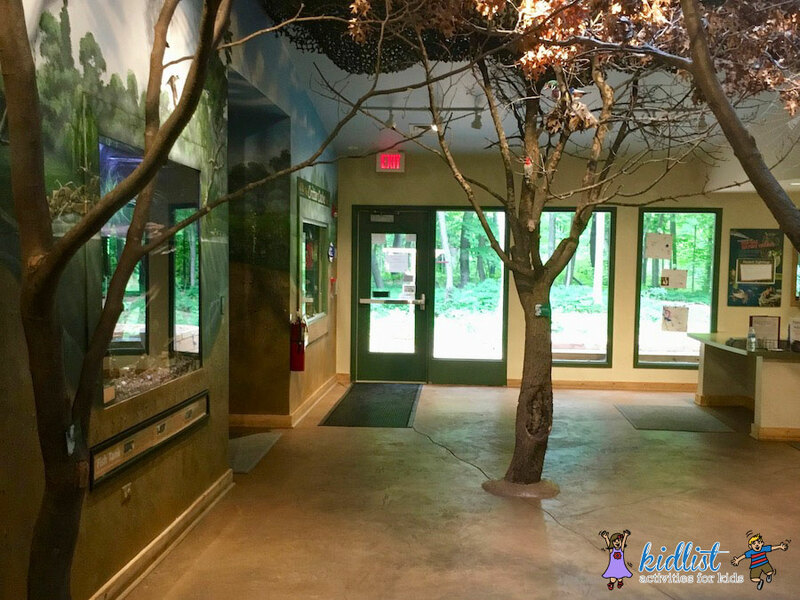 The nature center and playground area are geared more towards younger children (8 and under), but your older kids may also enjoy a hike along the trails, or a stop in the cave. 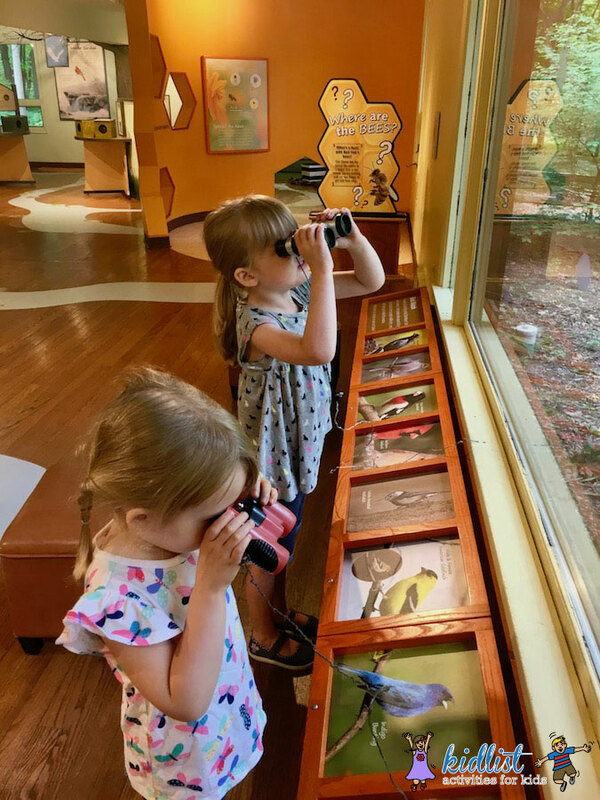 My girls, ages 2 and 4, were the perfect age to enjoy all of the exhibits and a short hike on the trails. 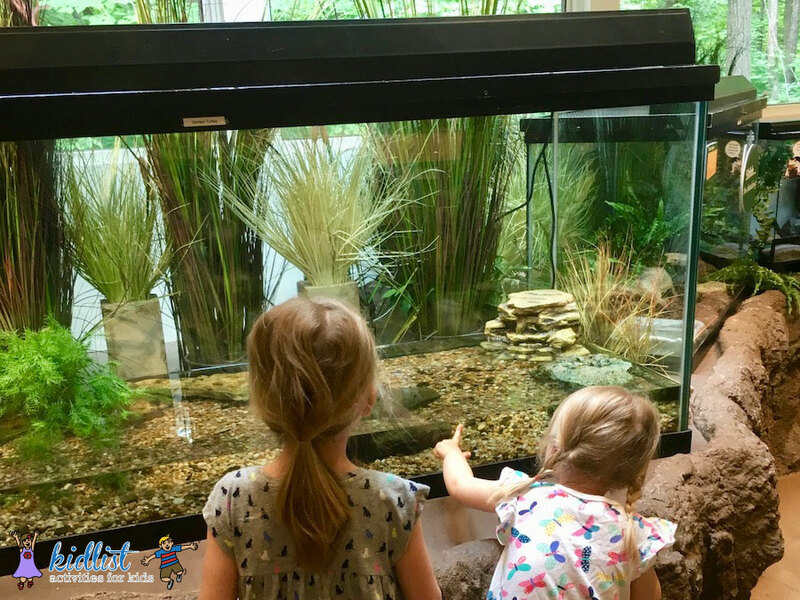 While they welcome field trip groups, Red Oak Nature Center also hosts their own summer camps and nature-based preschool. They’d recommend calling ahead to see if they expect high traffic from larger groups that day, as the weather can alter plans quite a bit. Red Oak Nature Center is entirely wheelchair accessible. Patrons in wheelchairs will have difficulty on all trails except Fox River Trail, as they are uneven terrain with mulch on the ground. 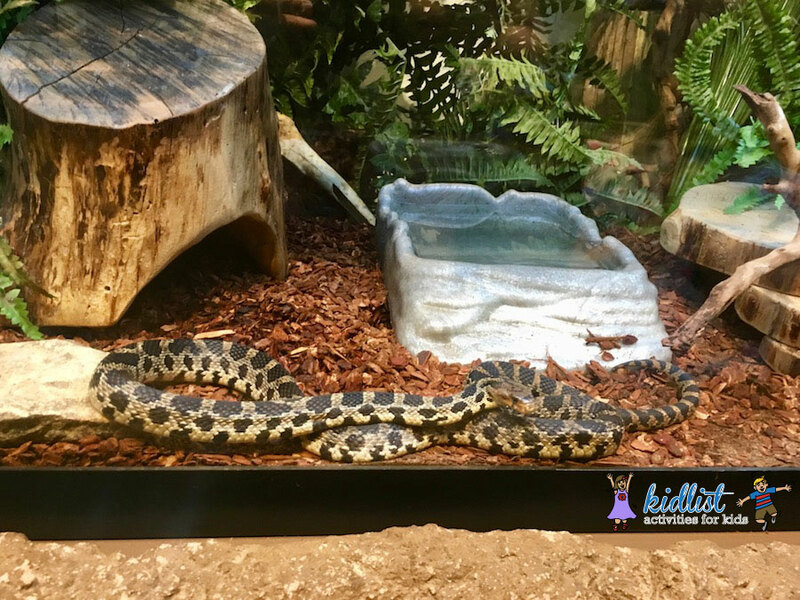 Check out our big list of all the nature centers in Chicagoland for even more great destinations to visit with your kids. 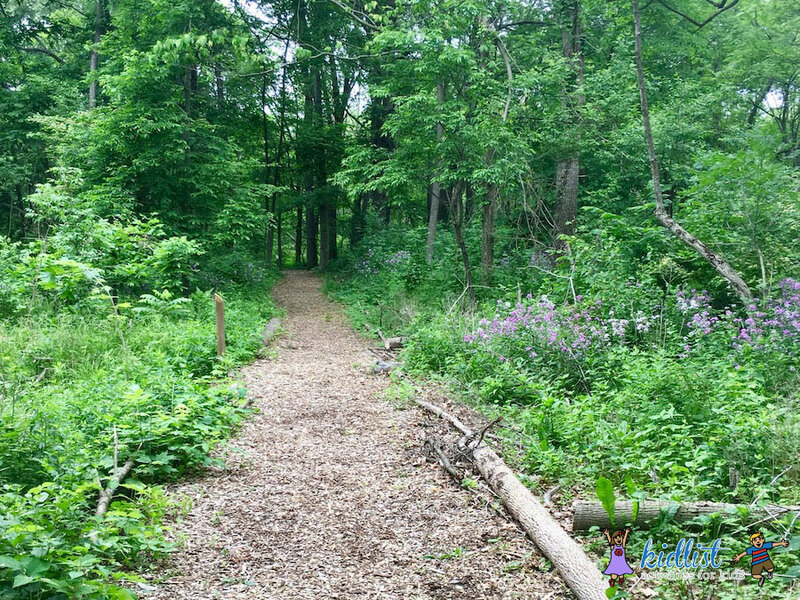 Be the first to comment on "A Visit to Red Oak Nature Center in Batavia"